SAINT-ANDRE: A mysterious piece of plane debris washed up on the French Indian Ocean island of La Reunion on Wednesday, prompting some speculation it could be part of the missing Malaysia Airlines flight MH370. "It was covered in shells, so one would say it had been in the water a long time," said one witness. French air transport officials have already opened a probe to investigate where the wreckage could have come from. Xavier Tytelman, an expert in aviation security, said it could not be ruled out that the wreckage belonged to MH370, which vanished without trace in March last year. No part of the wreckage has ever been found in one of aviation's great mysteries and Malaysian authorities in January declared that all on board were presumed dead. The plane disappeared en route from Kuala Lumpur to Beijing with 239 people on board. 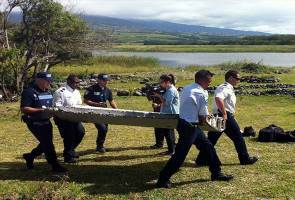 A mysterious piece of plane debris washed up on the French Indian Ocean island of La Reunion. Tytelman noted that local media photos showed "incredible similarities between a #B777 flaperon and the debris found," refering to a Boeing 777 -- the type of plane that disappeared. He also noted a reference on the wreckage: BB670. "This code is not a plane's registration number, nor serial number. However... it's clear that this reference would allow a quick identification. In a few days, we will have a definitive answer," Tytelman said. Boeing said in a statement it remained "committed to supporting the MH370 investigation and the search for the airplane". "We continue to share our technical expertise and analysis. Our goal, along with the entire global aviation industry, continues to be not only to find the airplane, but also to determine what happened –- and why," said the US aviation giant. 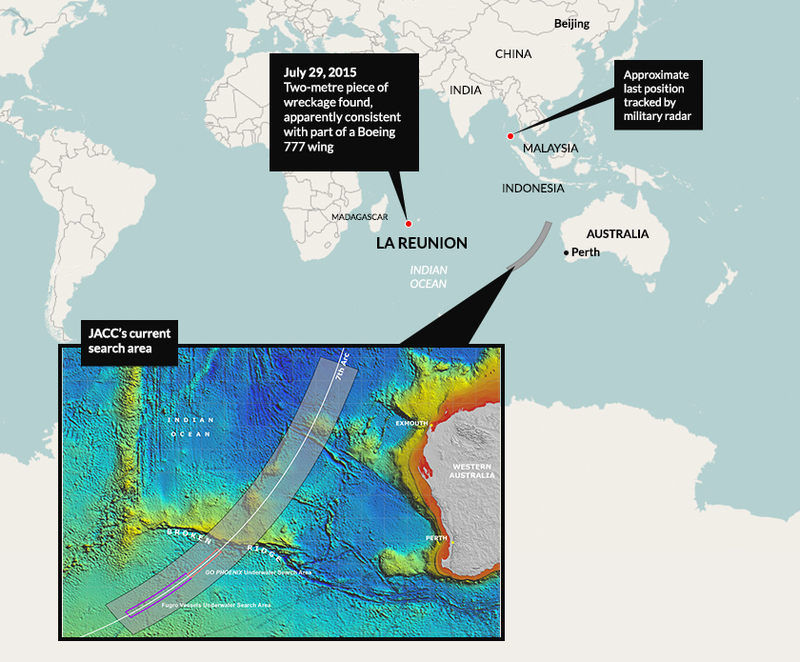 An Australian-led operation has scoured more than 50,000 square kilometres (19,000 square miles) of the seafloor, about 60 percent of a search zone in the Indian Ocean that was determined via expert analysis of signals from MH370 that were detected by a satellite. However the four search vessels towing 10-kilometre cables fitted with sophisticated sonar systems that scan the seabed have turned up little except shipping containers and a previously uncharted shipwreck. Rough weather, the pitch-black extreme depths of up to 4,000 metres, and the rugged nature of the previously unmapped seafloor have made for a slow, frustrating search. Angry next of kin have criticised Malaysia's handling of the plane's disappearance, and have questioned the choice to focus the search on the southern Indian Ocean. With the search proving fruitless, speculation on the fate of the plane remains focused primarily on a possible mechanical or structural failure, a hijacking or terror plot, or rogue pilot action. However nothing has emerged to substantiate any of these scenarios. The lack of solid information has sustained a flow of conspiracy theories, with books, documentaries and a thriving online debate positing a range of possibilities. These include suggestions that the plane was commandeered to be used as a "flying bomb" headed for US military installations on the Diego Garcia atoll, and was shot down by the Americans. The United States has dismissed this. US aviation expert Jeff Wise suggested earlier this year that the MH370 was commandeered to a Russian facility in Kazakhstan, possibly an effort by President Vladimir Putin to intimidate the West during the Ukraine crisis, or to gain access to a certain passenger or item in the hold.